There are a variety of ways to repair carpets depending on the damage and the type of material. Often times, repairing your carpet is a much more cost effective choice, especially if the damage is only in one area. 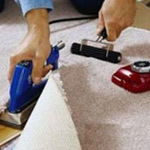 Carpet repairs are actually much more common than most people think and it is very possible that at one point, you will need to do a carpet repair. Carpet repairs include a variety of techniques, many of which as very affordable and can extend the life of your carpet. The most common types of carpet repair are stretching, re-seaming, threshold repair, dying and patchwork. Carpet stretching is necessary when the carpet has lumps or wrinkles. The process of stretching the carpet will make the carpet flat and provide a fresh look to the carpet. It will also extend the life of your carpet by eliminating the uneven wear of the carpet when the carpet is wrinkled or bunched up. Dying the carpet is an affordable way to cover up the spills or stains on the carpet, especially when products such a bleach are spilled. In cases where dying the carpet is not a possibility, we can use patchwork techniques to replace a small area of the carpet that has been damaged or stained. Both dying and patching as very affordable services in comparison to carpet replacement. If your carpet is damaged and you need help determining if the damage can be replaced, give us a call today and we’d be happy to inform you of what carpet repair techniques may work for you. We will also offer a free, no obligation quote for the carpet repair costs!